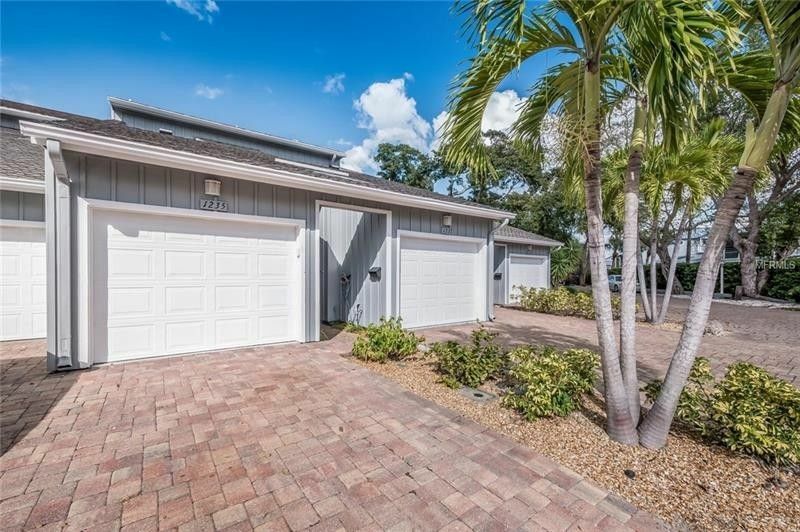 Bring your boat and your beach chair to live the Florida dream as your new home awaits you at Siesta Key's Harbour Towne. This tastefully appointed first floor 2-bedroom 2-bath unit is a rare find that includes a deeded deep-water boat dock AND lift, footsteps to #1 rated Siesta Key Beach and a very rare 1 car garage. Enjoy every inch of this well maintained and updated open floor plan with a real cook's kitchen that boasts wood and under-lit custom cabinetry, newer stainless high-end appliances, Corian counters with efficient storage throughout. Entertain and relax in the dining and living space which has been extended to the enclosed lanai with custom windows and screens. Two sliders from the roomy master makes for easy access to the lanai and outside paver patio to enjoy your morning “cuppa” with sunrise and sunset skies and serene waterfront views. Master bath is completely updated with private shower and large walk in closet. Don't miss the 2nd bedroom which has serene water fountain and garden views. Decorator finisher throughout including, custom tile, real wood floors, crown molding and so much more. If these features aren't enough, then this resort style gated community offers a heated swimming pool and spa, clubhouse, tennis court and picnic area. Steps away from boat slip & lift #8. Terrific buy on Siesta Key so make your offer now. Click on the virtual tour for more photos. Driving Directions: Take the South bridge on Stickney Point Road to the Key, north (right) on Midnight Pass Road, East (right) to entrance of Harbour Towne just before the light at Beach Rd.